This recipe is inspired by My Baking Addiction. Visit the site -- It's a must-see. This is a light, springy cake, which I think is perfect for this particular cupcake. If you prefer a more dense cake, just add a box of instant chocolate pudding mix to the cake batter. Never skip freezing the Reese's Miniatures -- having them that cold ensures they don't completely melt while baking. There will be a dip, or hole, in the top of the cupcakes after baking -- this is normal. You'll fill it with the buttercream frosting. Once my buttercream is at the consistency I want, I always mix on high for another 2-4 minutes to make it extra smooth. In this picture, I used a large round tip to pipe on the frosting, but I've also used an open star tip and it looks just as good; adding a sprinkling of grated chocolate to enhance the texture created by the star tip is an extra nice touch. Combine all ingredients in stand mixer (with paddle attachment) and beat until combined. 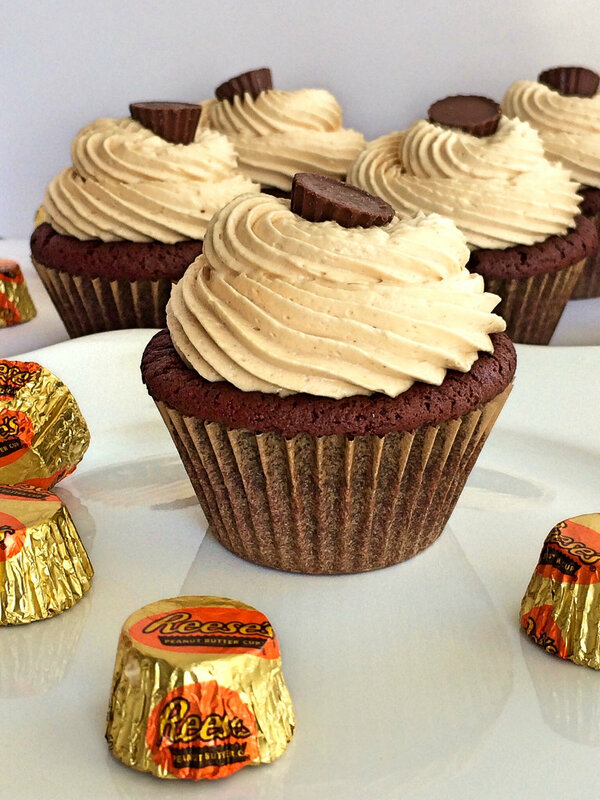 Press one Reese's Miniature in center of each cupcake. Fill cupcake liners 2/3 full. Bake 18-22 minutes (until toothpick comes out clean). Remove from oven and transfer cupcakes to wire rack to cool. Combine butter and peanut butter in stand mixer (with paddle attachment) and mix on medium speed until creamy (around 2 minutes). Turn mixer to low and slowly add powdered sugar until blended. Add vanilla and 4 tablespoons heavy cream. Mix on low speed until well-blended. Add 2-4 additional tablespoons heavy cream until frosting is your desired consistency. Beat frosting on high until it's light and fluffy. Pipe onto cupcakes and top with Reese's Mini.